To view 7 more pictures, interactive maps and the full, detailed description of the Wilson's Landing community, please Login. Getting a condo at new construction development, Wilson’s Landing, is like reclaiming personal freedom. Owning a townhouse or flat in this waterfront setting is a huge step towards living the dream. These units are so low-maintenance, residents have the luxury of time to do what they want when they want without having to worry about constant house upkeep. 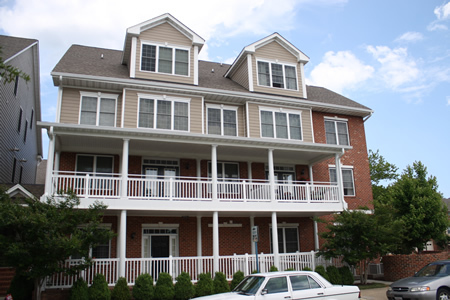 Ideally set in the bustling downtown area of Hampton, VA, this development is close to many city amenities. Military bases like Joint Base Langley-Eustis and Naval Station Norfolk are not far either. One of these 25 striking new construction units can be a personal paradise. Five buildings each house five homes so everything works out perfectly. Buying a flat or townhouse here comes with peace of mind knowing that each unit is built to withstand the pressures of time and the coastal seasons. Each new home at Wilson’s Landing may feature an attached garage, balcony, gas fireplace, gourmet kitchen complete with GE appliances, walk-in closet, loft, designer garage doors, 30-year architectural shingles, hardwood flooring, brushed nickel lighting fixtures, laundry room, ceiling fans and more. The sizes of these properties range from just under 1,300 square feet to a little over 2,400 square feet. Hampton is a modern city which still embodies Virginia traditions. This region is an exciting place to live as it continues growing. New construction malls go up and so do condo complexes like Wilson’s Landing. Townhouse and flat owners can enjoy all that downtown offers without even moving the car. Talk about going green! Tour some of the Victorian homes in the Victoria Boulevard Historic District and admire the architecture. Shop at the Peninsula Town Center or City Center at Oyster Point. Don’t forget that set of golf clubs when heading over to Woodlands Golf Course. There is so much to do in Hampton Roads and condo owners have the time to do it. Life in this new construction development is better than ever. Time is on your side in a townhouse or flat here. Spend a day with a condo resident; it could be life altering. Set sail for a new adventure at Wilson’s Landing. Send me more information about the Wilson's Landing new home community. Our agents gladly offer FREE property tours of Wilson's Landing, Hampton and homebuyer consultations to all serious buyers.